So my mom has this incredible machine. 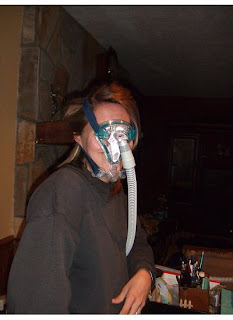 She got this machine about a year ago for her sleep apnea. She wears it every night when she sleeps. 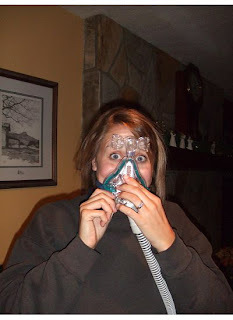 It forces her to breath regularly by blowing oxygen into her face. My parents have recently been putting down hardwood floors at their house and started in the bedroom. They had to move their bed into the living room and sleep about 2 feet from the television. Homecoming at the high school was one Friday night while they were still sleeping in the living room. After the football game, my brother and sister and a lot of their friends came home to spend the night. My parents went to bed (in the living room) and all those teenagers came downstairs multiple times for snacks or drinks, each time seeing my parents laying in the bed. Only, my mom wasn't looking normal...she had her nice machine on. Here's me trying it out. I couldn't figure out how to get it on. Keep in mind that it's blowing a ridiculous amount of oxygen in my face. Like a dummy, I turned it on and then tried to get it on my face. May I borrow the mask??????????????? I don't have a mask but my older son brings his friends to our bedroom on a regular basis to have conversations with us, well with his dad cause I'm usually asleep! Just wait kids have a way of catching you at your best moments!